Support ovarian cancer awareness & local businesses at The Blue Hydrangea Progressive Tea. Every April, Downtown LaGrange blooms with joy for their annual Blue Hydrangea Progressive Tea. This special event brings awareness to ovarian cancer while showcasing all that Downtown LaGrange merchants and businesses have to offer. The day begins at the Oldham County History Center where visitors check in, receive their raffle tickets, special teacup, and gift bag. After this, the visitors are free to explore Downtown LaGrange at their leisure. There are over twenty merchants and restaurants participating in the 2019 event, held on April 28th this year. This is a great time to shop and get to know business owners. Look for the special teal ribbons and tea signs in the windows indicating the business is a participating partner for the event. Inside the business, you will find a refreshing beverage and treat. Some of the displays are too beautiful to eat. The tea is warm, iced and some businesses will put their own twist on the tea. Don't forget to put your raffle tickets at your favorite store! This beautiful event is a wonderful way to support local businesses, enjoy the company of friends and delicious treats and support women's health. The 2019 event is April 28th, 1-5pm. There is a special blessing for those thriving at 12:30pm. Tickets are $15 in advance and $20 the day of the event. The Oldham County History Center is located at 106 N 2nd Avenue. More information can be found on Downtown LaGrange's website here or the Facebook event here. Friday: Friday night is the First Annual Derby Market at 3rd Turn Oldham Gardens at 4pm. Saturday: The First Annual Derby Market at 3rd Turn Oldham Gardens is also on Saturday. There are several Easter egg hunts on Saturday. Check out the list of places here. 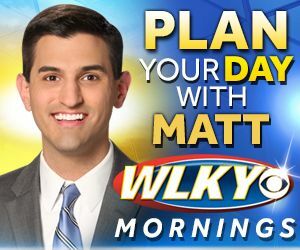 Check out the weekend fun in Louisville! Sitting along the Ohio River in Goshen is the wonderful Woodland Farm. We visited this beautiful working farm last Fall and fell in love. 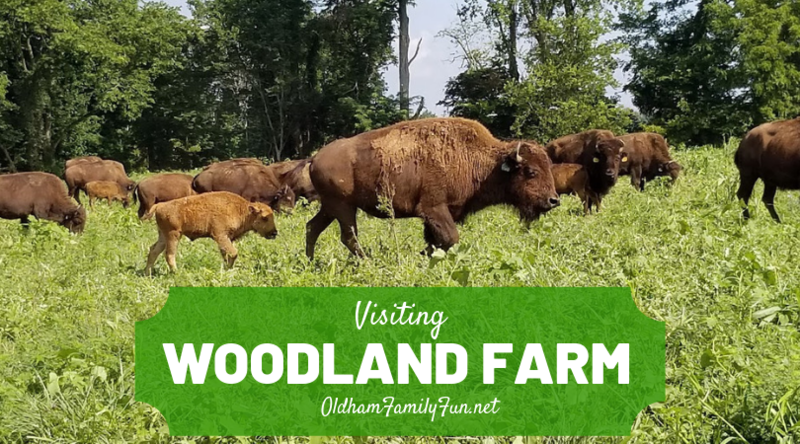 Oldham County is home to several horse farms, but at Woodland Farm, visitors can learn about Kentucky bison and sustainable farm practices. Woodland Farm is over 150 years old and is on the National Register of Historical Places. 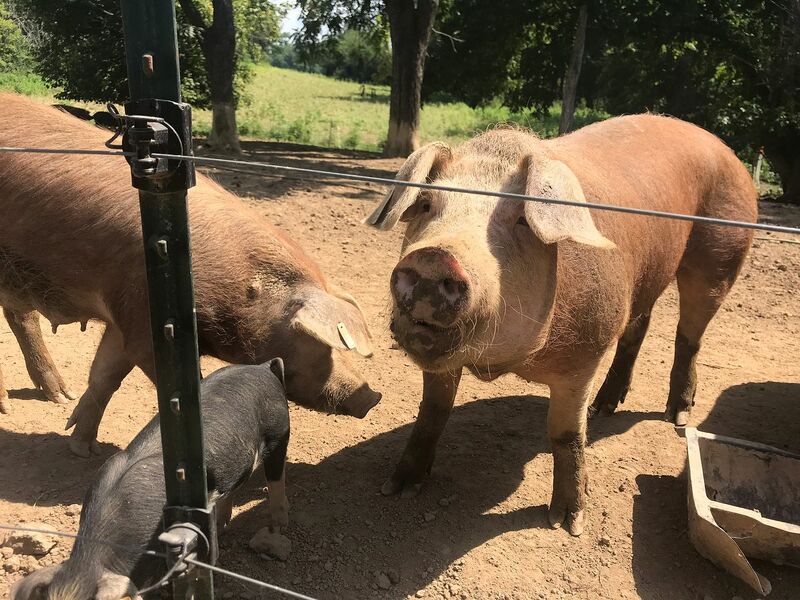 It was once slated to be subdivided until Laura Lee Brown and Steve Wilson purchased the farm in 1996 and turned it into the farm it is today. Lucky for us, the farm offers tours for visitors to explore and learn more about the land and animals. Our tour started at the farm store where we were picked up by farm manager, Kristopher Kelly. We hopped in the back of his pickup truck and set out on our tour. The first stop on the 1,000 acre farm was to visit the bison. We stopped in the middle of a field where several bison surrounded us. Kristopher spoke to us for a while about the animals and answered our questions. It was neat to learn about the bison and see them up close. There were several babies in the field that the kids enjoyed seeing. After leaving the bison, we drove closer to the Ohio River where we passed a beautiful home, garden and developing orchards. We zig-zagged our way through the woods down to the Ohio River, stopping to see the green bunnies and for Kristopher to point out old tree forts hiding in the woods. Many of the structures on the farm were built using lumber from trees on the farm, adding to the sustainable process the farm prides itself on. 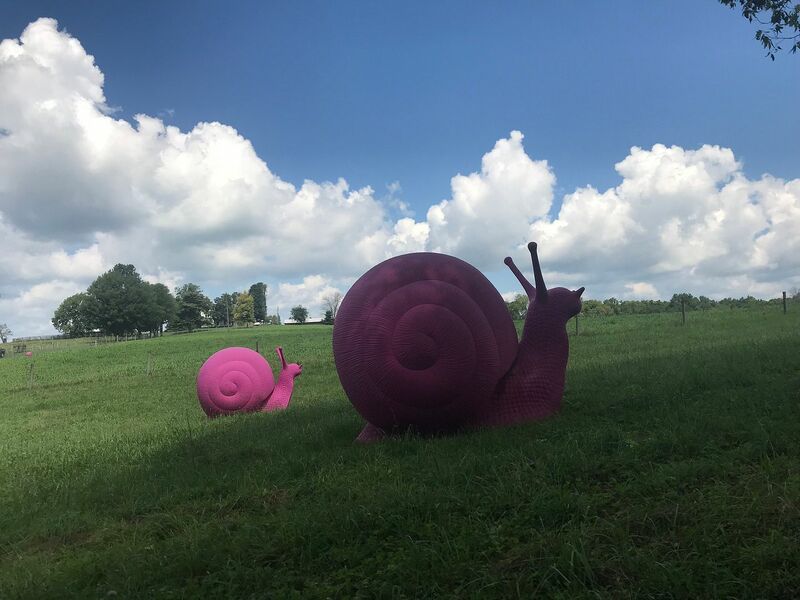 Visitors will notice unusual creatures in the fields including the green bunnies and pink snails located near the entrance to the farm. The artwork adds joy and beauty to the tour. On the banks of the Ohio River, we stopped and walked to visit the pigs and chickens. We caught some of the piglets rushing back to their moms, ducking under the fencing and squealing along the way. Kristopher found some remnants of corn in an adjacent field and let the kids feed it to some of the pigs. In this area we also saw chickens and learned about the different breeds of pigs and chickens on the farm. We loaded back in the truck bed and made our way back to the farm store for the end of our tour. We marveled at the vastness and beauty of the farm. We left with a new appreciation of how much work goes into the daily chores and upkeep of Woodland Farm. Tours are open to the public April-October and are generally held on the first Thursday of the month at 10:30am. If you have a group of ten or more people tours can can be scheduled any weekday. Tour prices are $12 for adults and $6 for children. There is a discount for large groups. Woodland Farm is located at 4716 Greenhaven Lane in Goshen, Kentucky. Grab the family, the lawn chairs and snacks and check out some of these outdoor concerts scheduled! Check out the lineup for outdoor concerts in Oldham County and the surrounding area. Most of the concerts are free and family-friendly! As with any event, please make sure you check with the business or venue beforehand. Schedules are subject to change due to weather or other reasons without Oldham Family knowing. 8/24 - The Brits are Back! Follow them on Facebook for updates on music acts. Sunny days are coming and The Parklands of Floyds Fork has a free program to learn more about the giant star! If you have a space enthusiast in your family, April SUNdays is a great way to learn more about our solar system in the beautiful surroundings of the Parklands. Two years ago, we visited The Parklands of Floyds Fork to learn more about the 2017 Solar Eclipse. The Louisville Astronomical Society was set up at the park to educate families on how to properly view the sun. April SUNdays in The Parklands is back again this year and there are three Sundays to participate in this free program. April SUNdays in the Parklands is a fun program put on by the Louisville Astronomical Society. On Sundays in April, members of the Louisville Astronomical Society will be at different sections of The Parklands from 1-3pm. Visitors can talk with a member of LAS, safely view the sun with one of their telescopes and learn about upcoming programs. This year, visitors will view the sun safely as they observe Sol, the park's private star. LAS members will also show visitors sunspots and prominences on the sun, teach about NASA’s Parker Solar Probe which is orbiting the sun and have a meteorite collection on hand. The Louisville Astronomical Society members are very passionate and love to educate everyone about the solar system. We love seeing them set up at different areas of town and how patient and giving they are with their time and resources. Definitely try to check out one of the Sunday events and enjoy The Parklands as well. Well, hello April! What do you have in store for us? Short sleeves, relaxing and blowing bubbles out in nature. That looks wonderful, doesn't it? Fingers crossed April brings us warm weather for all of these fun events! 4/3: FREE! Bigfoot Day at the Oldham County Public Library in LaGrange. Crafts 11-12:30pm and Presentation at 1pm. No registration required. 4/8: FREE! Crafty Kids Club at the South Oldham Library in Crestwood, 4pm. Registration required. 4/10: FREE! LEGO Club at the Oldham County Public Library in LaGrange, 4pm. Sign up online. 4/13: FREE! Knights & Fairy Story Time at the Oldham County Public Library in LaGrange, 11am. Sign ups online. 4/13: FREE! Spring Wildflower Walk with Tavia at Creasey Mahan Nature Preserve in Goshen, 10am. Donations are accepted. 4/15: FREE! Kids Cooking Club at the South Oldham Library in Crestwood, 4pm. Sign ups online. 4/17: FREE! Kindness Club at the Oldham County Public Library in LaGrange, 4pm. Sign ups online. 4/20: 9th Annual Kentuckiana Independent Authors Fair at the LaGrange Community Center, 10am-4pm. 4/24: FREE! Pokemon Club at the Oldham County Public Library in LaGrange, 4pm. Sign ups online. 4/25: FREE! Pokemon Jr Party at the Oldham County Public Library in LaGrange, 4pm. Sign ups online. 4/28: 12th Annual Blue Hydrangea Tea in LaGrange, 1-5pm. Purchase tickets before it sells out. 4/29: FREE! Word Worms at the South Oldham Library in Crestwood, 4pm. Sign ups online. 4/30: FREE! Drop-in Crafts at the Oldham County Public Library in LaGrange, 6-7:30pm. Make a Derby horse! Additional date on May 2nd. Hippity Hoppity! The Easter Bunny is coming to Oldham County! Louisville area Easter events here. FREE Pictures with the Easter Bunny at Cabela's in Prospect. $5 admission includes the hunt, bouncies and visit with Easter Bunny. Oldham County's Largest egg hunt. Egg hunt and pancake breakfast. Please note this is not at the church, but down the road at the fire station 2414 W. State Hwy 22. Norton Commons YMCA - Cancelled per Facebook post here. Please come to one of the three services that day and attend the egg hunt at 12:30pm. Staying home for Spring Break doesn't have to be boring. Get out and explore the Oldham County & Louisville Area. We have listed some indoor and outdoor ideas for families to try during Spring Break. Many are free or cheap and range between close to Oldham County and beyond. As always, please contact each business beforehand to ensure there are no unexpected scheduling changes. 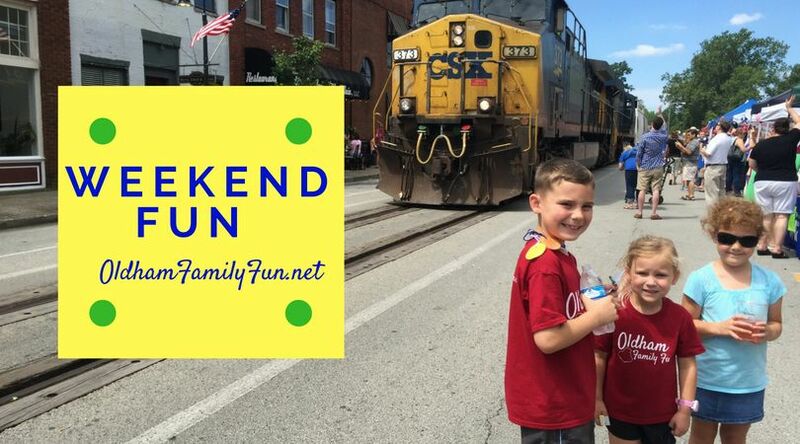 3/30 & 31 and 4/6 & 4/7 Check out the LaGrange Railroad Museum and have lunch on Main Street. Catch a view of a train from the observation deck. 4/3 The Oldham County Public Library has a special Big Foot Program scheduled. Drop in crafts from 11am-12:30pm and presentation at 1pm. 4/3 & 4/6 Head over to Creasey Mahan and enjoy their Nature Center. The center is open on Wednesday and Saturday mornings. Check out the LaGrange McDonald's new playground and then head over to the new Feeders Supply. My kids love to see the fish, crawly creatures and adoptable pets. Have a tea party at Sisters Tea Parlor & Boutique in Buckner. Take a dip in the pool at All About Kids Sports Center in Crestwood during their open gym and swim! 4/6 Build a window birdhouse at Home Depot for free. Check out events happening at Cabela's or visit the large aquarium. Grab some different flavored popcorn at The Popcorn Station in Jtown to enjoy during a movie at home. They have 35 different sweet and savory flavors to choose from. If the weather is decent, try an outdoor movie! The Popcorn Station is located right in front of King Pin Lanes. Go bowling while you're in the area! Old School NY Pizza near the Forest Springs Shopping Center has Kids Night Out on Tuesday nights 4-9pm. Kids can make their own pizza for $4 (drink and dessert included)! Want more dessert? Baskin Robbins has $1.31 scoops on Saturday, March 31st. Champs Rollerdome has Spring Break specials. You can also sign up for the Kids Skate Free program. Go play cheap "old school" video and pinball games at RecBar in Jtown. Children are welcome to join adults at this restaurant up until 10pm. Most games are only a quarter to play (bring cash for the token machine). Kids meals are only $5! Have you heard of the Wi Bit? Try out this inflatable obstacle course at the Fort Knox Aquatics Center. Make your reservation before your visit. Two sessions on 4/6. Ages 6 and up can participate. More information here. Paint at Gogh Crazy Art Studio in Shelbyville. Visit Salato Wildlife Center in Frankfort. Indoor & outdoor fun! Drive to the capitol building and take a photo on the front steps or schedule a tour. Enjoy some ice cream on the front porch of Knock on Wood in Westport. Walk down to the Ohio River and Westport Park. Check out our parks list here and choose from hiking, bike riding, tennis, pickleball, disc golf and more. Visit Creasey Mahan Nature Preserve in Goshen! There are hiking trails, playgrounds and indoor Nature Center to explore. Go on a scavenger hunt at Yew Dell Gardens in Crestwood! Check out one of the Backpacktivities or Book-n-Blanket Bags. Children 5 and under are FREE! Visit Hays Kennedy Park near Prospect. Pack a picnic, bikes and play on the playground. After the fun at the park, visit Henry's Ark Petting Zoo. You can also walk the new East End bridge while you're in the area. 4/6 & 4/7 Kentucky Shakespeare Shakespeare in the Park has shows scheduled on these days. Admission is free. Visit the Crescent Hill Neighborhood area. Walk around the Crescent Hill Reservoir off Frankfort Avenue, grab a yummy baked good at Blue Dog Bakery & Cafe, check out the new store, Sadie Makes 4 and the other shops. Seneca Park is nearby too. Bernheim Forest has a Spring Break Adventure Week planned that includes hands-on discovery stations in the visitor center, tower tours and guided hikes. The programs are free. Make sure you check out the Forest Giants too! 4/6 Josephine Sculpture Park in Frankfort has their ReForest Frankfort event. Be prepared to dig in the dirt and bring your own shovel. Enjoy visiting with vendors, live music, tree planting and take home a tree of your own for free! There are several events scheduled at Clifty Falls State Park in Madison, Indiana during Spring Break including Turtle Time, a Waterfall Hike, crafts and more! Check out our Spring Break Destinations List for more indoor & outdoor ideas and Spring Break Camps here! More ideas from Louisville Family Fun here. If you're staying home for Spring Break, we have a fun day trip idea for you! 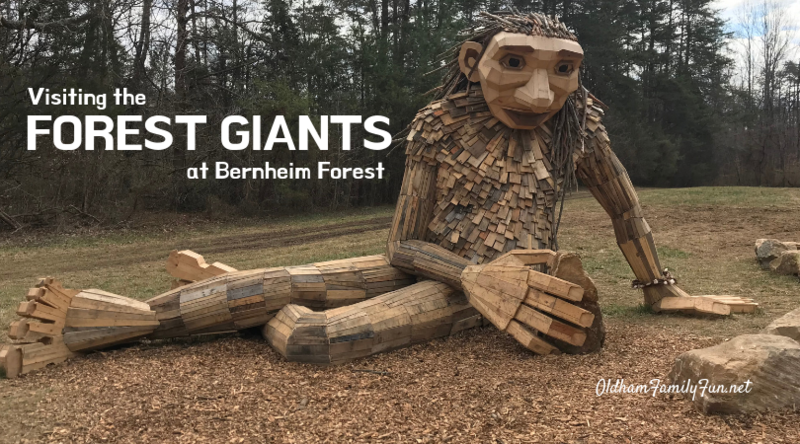 Head down to Bernheim Forest and check out the Forest Giants! 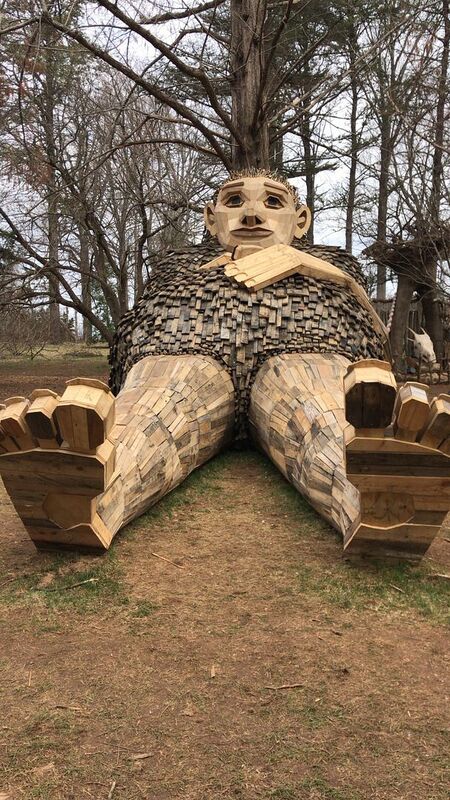 We visited Bernheim Forest's three giants this past weekend and they were so cool to see. Bernheim Forest has several fun activities and events planned during April 1-5. Check out their Facebook event here for more details. There are concerts, discovery stations, walks and more planned all around the three giants. 1. Prepare to walk a little. Two of the giants are close to parking areas (Little Nis and Mama Loumari). The third giant (Little Elena) requires a little bit of a walk (not too far though) to reach her. If you want to walk to all three of them, the whole trip is about two miles. It's a flat walk on pavement along Arboretum Way and gravel trails near Lake Nevin (these might be tricky for some strollers). We walked on Arboretum Way and then cut through the fun grassy field trails on our way back to our car. 2. Pack some snacks or a picnic. How cool would it be to eat your lunch with a giant? If you forget to pack something to eat or drink, there is a cafe at the visitor's center. 3. Grab cash and quarters. There are machines for turtle and duck food near Little Nis. If you visit on Saturday or Sunday there is a $5 charge (for non-members) to enter Bernheim Forest. They do take credit cards, but cash is fast. 4. Be patient. These giants are popular. On the day we visited, many families were taking turns getting a picture of the giants. Everyone's excited! Mama Loumari has an entire area behind her to check out. Take some time to look around at what the artist, Thomas Dambo, created. 5. Hints on finding the giants: You'll see Little Nis on your right as you approach the Visitor's Center. Mama Loumari is either a walk or drive over near the Sun Shade Loop. The third lounging giant, Little Elena, is on the backside of Lake Nevin in the park. See a map of Bernheim Forest here or be sure to grab a map at the Visitor's Center. We loved visiting the giants. We had never explored down by Lake Nevin in the park. Because we walked to each giant, we got to see many parts of the park we normally skip over during Bernheim's special events. We hope you get to explore Bernheim and experience these wonderful sculptures over Spring Break. If you miss them over the school break, don't worry they will be at Bernheim 3-5 years. Oldham County 2019 Spring Break is April 1-5. Get your kids in a camp! Looking to keep your kids busy and learning during Spring Break? Check out these Spring Break Camps! Different camps each day with a new theme for ages 6-11. AM & PM or Full Day options. Looking for more? Check out Spring Break Camps in the Louisville Area. Several are close to Oldham County. Louisville list here. 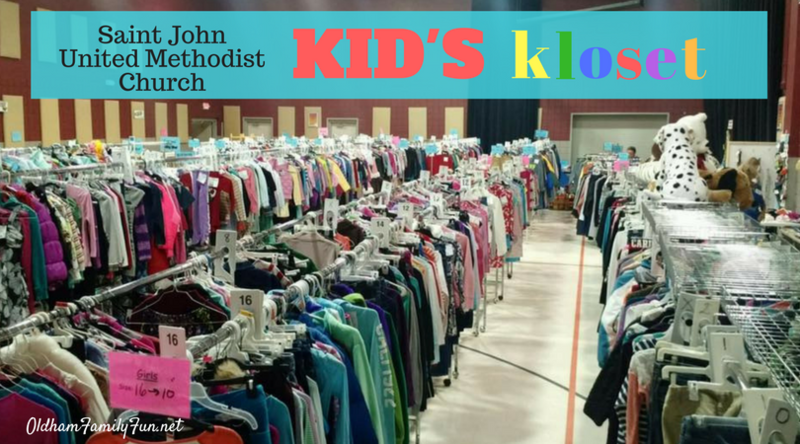 It's time for the Saint John Kid's Kloset Consignment sale! We feature brand name fall and winter clothes (infant, toddler, juniors and young men’s). 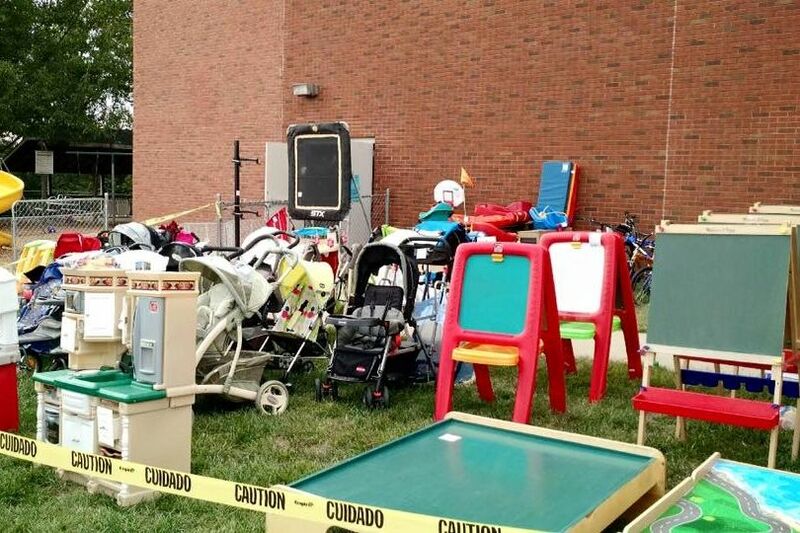 Shoes and accessories, nursery items, books, kids furniture/décor, toys, video games, DVDs, bikes, strollers, bedding, sports equipment, arts and crafts, school supplies and more. 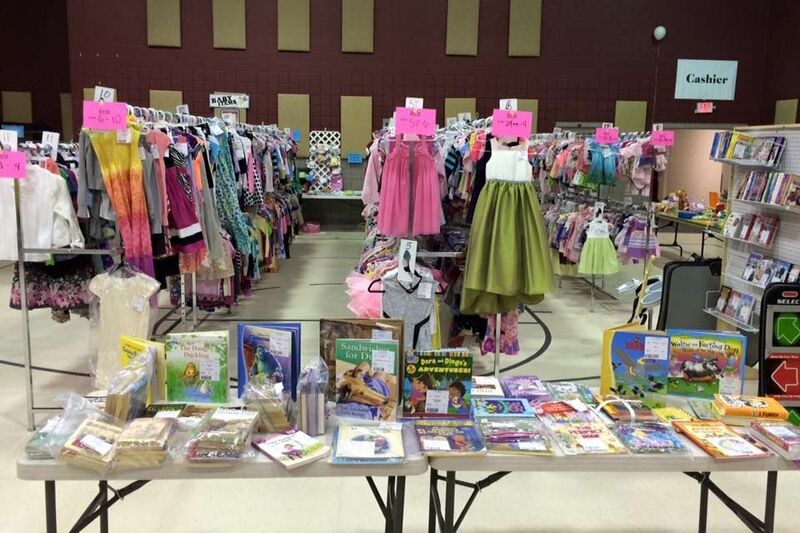 You'll find lots of quality merchandise at great prices for all the kiddos on your list. 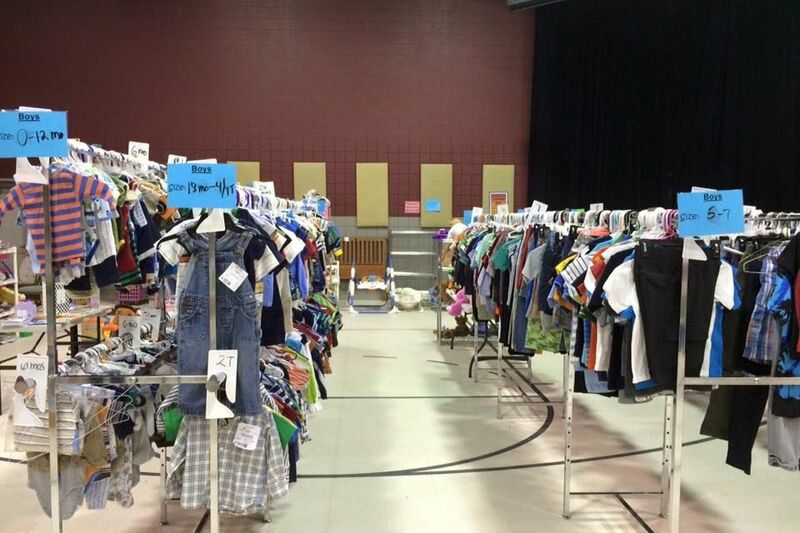 In addition to all the great bargains you'll find, you'll also be shopping for a cause! The proceeds from our sale benefits children in our community, state, country and around the world. 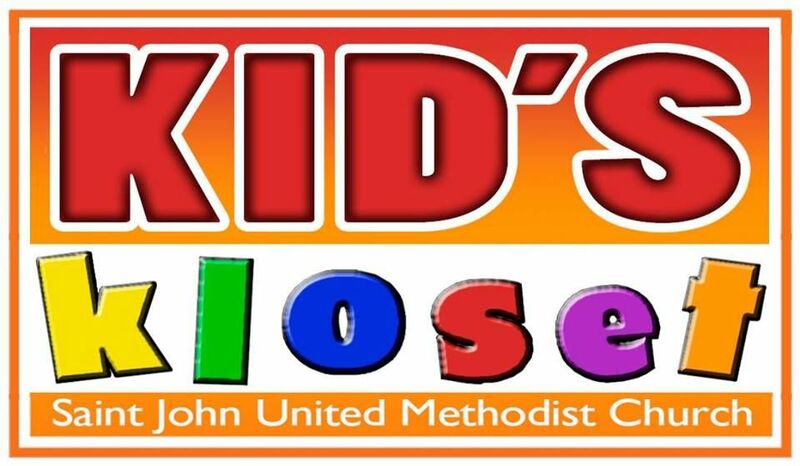 St. John Kids Kloset is dedicated to furthering the welfare and education of God’s children by whatever means necessary. We have given away over $370,000. When you shop this sale, you are making a difference! There are two sales each year; fall and spring. Shop our spring/summer sale this Friday & Saturday, March 22 & 23! Friday’s hours are 9am-7pm and Saturday’s are 9am-1pm (with many items half-price that day).